Ann Tashi Slater is an Associate Professor of American Literature at Japan Women’s University in Tokyo. She did her BA in Comparative Literature at Princeton and her MFA in Fiction at the University of Michigan, Ann Arbor. Her publications include a story in American Dragons, an anthology of work by Asian American writers (HarperCollins). Her stories have also appeared in Painted Bride Quarterly and Private: A Journal of Arts and Literature. Her translation of a novella by Cuban writer Reinaldo Arenas was published in Old Rosa: A Novel in Two Stories (Grove Press). Slater does radio and TV programs for NHK, and has also worked in Tokyo publishing and journalism. 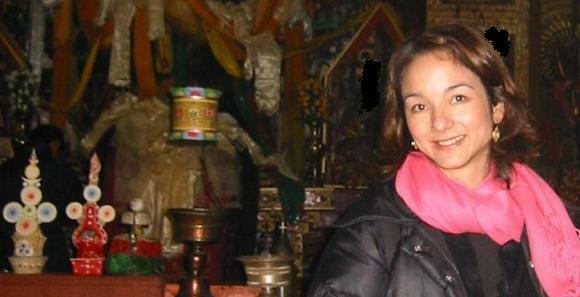 She’s Tibetan-American, was born in Spain, grew up in the San Francisco Bay Area, and has lived, traveled, and worked around the world in places including France, Cuba, Mexico, Venezuela, Bali, India, and Tibet. Her story “Things You Dreamed of and Things You Didn’t” appears in Yomimono #15. A trip I took years ago with my kids to see the Big Buddha in Kamakura. When we got there, my son—who was about three—stood at the foot of the Buddha, saying, “Where’s the Big Buddha? Where’s the Big Buddha?” It seemed like a very philosophical question at the time and still does! 2. Describe your writing space. My writing space is a tatami room with a view of trees, sky, crows perched on rooftops and stone walls. It’s filled with things from my travels: a statue of Ganesh from India; a Mexican Day of the Dead tableau of a skeletal orchestra; a bird cage from Hong Kong. There are old family things—a Tibetan prayer wheel, my grandmother’s sandalwood rosary, photos from turn-of-the-century India and Tibet. And other photos: Gregory Peck and Audrey Hepburn on the Spanish Steps in Roman Holiday, a shot of elephants crossing the African plain. Lots and lots of books. A small sofa for napping . . . I mean, deep thinking. And always—under my desk or at the window watching the rain fall or sprawled on the tatami—my little Westie. Learning to Breathe: One Woman’s Journey of Spirit and Survival by Alison Wright. A memoir about the author’s road to recovery after she barely survived a horrific bus accident in Laos. This book made me think about how through faith—and what we do because of faith—we can change what seems to be our fate. Also, Olive Kitteridge, which I really enjoyed for its nuanced, precise illumination of the characters’ mental and emotional states. And I recently re-read the tour de force trilogy at the end of Unaccustomed Earth. Lahiri’s portrayal of Bengali immigrants in America, of how they navigate family and romantic relationships, loss and its aftermath, is deeply believable and very moving. 5. What’s your favorite place in Japan? I love Kiyomizu Temple in Kyoto. The wide veranda, the huge pillars, the cherry and maple trees, the view of the city. The two “love stones” at one of the shrines: pilgrims who walk the 18 meters from one stone to the other with their eyes closed will, it’s said, find true love. Beautiful story, thoughtful and evocative interview! I look forward to reading more of your work soon, Ann!